I took August off due to the many things that flooded my usually sane life. When I saw the challenge for September, I was very excited. I love puff pastry and find it a valuable resource for the holidays. Beef Wellington, appetizers, dessert, it really goes the distance. For the past few years I have seen a puff pastry for sale in the Williams Sonoma catalog touted to be much better than the famous frozen food brand at the grocer. I could never bring myself to part with the cash to try it. So this month I embarked on the Julia Journey and made it from scratch. You start with a pound of butter, so from there what could go wrong? I watched the PBS video with Julia and found it a good refresher although I saw every PBS show from the Baking With Julia Book, it was my version of Saturday morning cartoons for awhile. The ingredient list is small: butter, flour, water, salt, and a food processor and rolling pin are the only utensils so to speak. This is not a task for anyone in a hurry or in a hot climate without air conditioning. Although it is September in Memphis, it is so muggy, I cranked the air way down, but still found a good hour of chill time necessary between turns. To say the recipe and instructions are lengthy would be an understatement. If you really want to make this, Google it and find the original Julia recipe for puff pastry. From the finished puff pastry, we make the Vols-au-Vent, French for "windblown" due to the lightness of the pastry. They are a hollow shell happy to encase any filling. I made my obligatory Vols-au-Vent with whipped cream and strawberries. It is imperative with the warmth that you roll small portions of dough so it doesn't get too soft, you never want to see butter ooze. The idea is to cut a large circle say 3" diameter, then a second. You then cut out the inside of the second circle and place the ring left around the first circle. The idea is that you make a bit of a bowl for filling. I did circles, stars and flowers. My cutters apparently weren't sharp enough, because where I had to stretch a bit, the pastry didn't rise. I took the cut insides from my shells and also brushed them in the egg wash and sprinkled a little black finishing salt on them. My own amuse bouche. They discourage wadding the scraps and re rolling, but suggest you stack the scraps to re roll. I took what was left and sliced them into strips with a pastry wheel and wrapped a few queen olives. After wrapping them I froze them and then put them in an airtight container. Some night when the temperature drops and we are relaxing with a glass of wine, I'll pop them in a 400° oven and enjoy that puff with the salty earthy olives. Mmmmm, makes me wish for cooler weather right now. Then I happily rolled the remainder of my puff pastry flat and folded and put it in the freezer so at a later date I can make cheese straws, and wrap it around savory appetizer fillings and make more Vols-au-Vents. Sounds like another blog in the making! Am seriously hoping one of these upcoming Daring Baker's Challenges calls for yeast, I am hankering to bake bread! It has been wildly busy. A few 15 hour days, no time to eat, let alone cook and bake. I did get a few sugar cookie orders out the door. First was a Notre Dame vs. Michigan State tail gate. Now let me put this out there right now. I hate Michigan State. It isn't personal, it's Big 10. When I was at Iowa in the 80's, they were the team to beat, I can't let it go. Needless to say the cookies were for the good guys. Logo cookies no less, and they had to travel, so smooth royal icing was my only option so they would be presentable. I think they looked pretty good. And as a side note. Notre Dame won! The next was a baby shower. These are a free form baby head I found in an old LA Times article from 1999, pastry chef Cynthia Heir designed them. The mom-to-be is being induced today, so I guess it is safe to say my cookies won't throw anyone into labor. That is a good thing. Next on the agenda is Halloween. I am stocking my freezer with ghosts and pumpkins before my European road trip so I am ready for the ghoulish festivities when I return. European road trip you say? Yes, and I am planning on blogging from abroad! Get in there and bake! Some things are just worth repeating, low fat banana bread is one of them. I had a counter full of over ripe bananas, so I whipped up a few loaves. Even I find it easier to look at my blog (last fall's blog) than dig up a recipe. I made a few alterations...imagine that. I used whole wheat flour and brown sugar in a loaf, and used some milk chocolate Guittard discs that were on sale at WS. The aroma is heavenly, and the results, nothing shy of perfection! Now I need another 15° drop in the temp and everything would be grand! Here's the old blog. For the occasional baker, banana bread can be a problem. Grocery store bananas are usually too green, and when mine are perfectly ripe at home, the mood just isn't there. My solution is the freezer. I toss perfect banana bread bananas right into the freezer, skin on. When your ready to bake, pull them out and let them sit at room temp for about 15 minutes. I am not going to lie to you, they are a little gross. They get black skins,mushy and wet, but when they are still a tiny bit firm, cut the stem off, peel them and cut them up. When they are totally thawed they'll be perfectly mushy! The recipe is always the dilemna. I've made a bunch and they all seem the same. Most old fashioned banana breads call for vegetable oil instead of butter. It makes it a snap, but vegetable oil is pretty flavorless. I was going through my tub file yesterday,( I know most people have recipe boxes), and I went through the quick bread file looking for something different. And there it was. 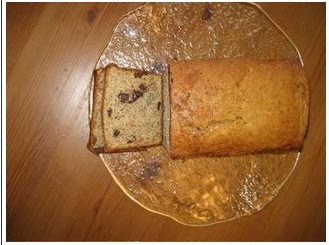 A low fat banana bread. Dated 2004. Unfortunately, I have no idea where it came from, but I must have liked it by the looks of the recipe so I baked up 2 fabulous loaves. One studded with bittersweet chocolate. They rose beautifully in the oven, and cooked all the way through, no goopy middle. I cooled them in the loaf pans and wrapped them in them overnight. When I sliced them today to freeze they were soft and moist and pretty damn good! Here's the recipe, make it often! Happy Baking! Preheat oven to 325 degrees, I use convection bake. Spray a loaf pan with BaKlene or Baker's Joy. Beat eggs and sugar until it is pale yellow and light. Mix in bananas, buttermilk, oil and vanilla. Add all dry ingredients through a sifter and mix well with a rubber spatula. Do not overmix. Pour into loaf pan. Bake about an hour. Cool in loaf pan. Yum! Makes 1 loaf,or 2 short loaves. Do not double, make it twice if you want 2!